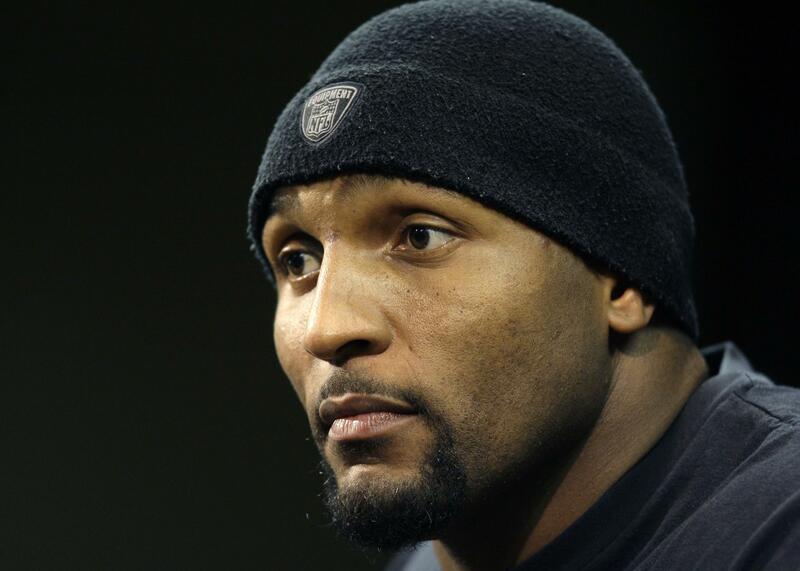 Baltimore Ravens linebacker Ray Lewis talks with the media during a news conference, Friday, Jan. 16, 2009, in Owings Mills, Md. The Ravens will play the Pittsburgh Steelers in the AFC championship football game Sunday. On April 20, 1996, the date of that year’s collegiate draft, the Baltimore Ravens tapped two men who would forge their places in league history. Jonathan Ogden established himself as one of the best left tackles in league history, while Ray Lewis is seen in some circles as the greatest middle linebacker the NFL has ever produced. Lewis and Ogden were teammates and Super Bowl champions, each taken in the first round of the draft, 22 picks apart. It’s what’s happened since they hung up their purple and black gear that is fascinating. While Ogden, a 6-foot-9 inch gentle giant of a man, has largely faded into obscurity since his 2008 retirement, Lewis has been anything but quiet since he left the game after the Ravens 2012 world championship. It’s Lewis’ most recent public pronouncements that hang around the necks of the Ravens like a noose, threatening to damage the fragile peace the team seemed to be heading toward after a turbulent summer. Lewis, in his role as a commentator on Showtime television’s Inside the NFL program, spilled the beans last week on how the Ravens passed on signing free agent quarterback Colin Kaepernick. In case you missed it, the Ravens played footsie during the summer, first indicating interest in Kaepernick, then declining to sign him without explaining whether Kaepernick’s protests against perceived police brutality were the reason. According to Lewis, who was acting as consigliere to owner Steve Bisciotti and general manager Ozzie Newsome, the team was prepared to sign Kaepernick to a contract. That is, until Nessa Diab, Kaepernick’s girlfriend tweeted out a picture of Lewis and Bisciotti that called to mind an image from the movie Django Unchained of actors Leonardo DiCaprio and Samuel L. Jackson. The original picture depicts DiCaprio as a slave master and Jackson as a slave. Diab’s representation placed Bisciotti in the DiCaprio role, with Lewis standing in as Jackson. On the Showtime program, Lewis said he had talked Bisciotti into signing Kaepernick, even after Lewis spent the summer loudly and publicly counseling the quarterback on how to make himself presentable for NFL owners. But when the Diab photo came to light, Bisciotti demurred, according to Lewis, whose representation has not been countered by the Ravens. Admittedly, the timing of Diab’s photo could hardly have been worse for Kaepernick and the photo was, shall we say, more than a bit off-color. But one wonders where, besides his declarations of his own moral rectitude, where Ray Lewis has the authority to counsel anyone on their behavior. Let’s not forget that Lewis was the subject of a homicide investigation in Atlanta surrounding the Super Bowl 17 years ago. He was initially charged in the double murder, eventually pleading guilty to obstruction of justice, as he copped to lying to police about what he knew. In other words, the Ravens and Bisciotti were willing to take advice from a man who lied to police rather than sign a man who protested them. Here’s a little friendly and free advice for Steve Bisciotti: Next time you need a tip on who best should be on your roster, ask the other guy drafted in 1996.